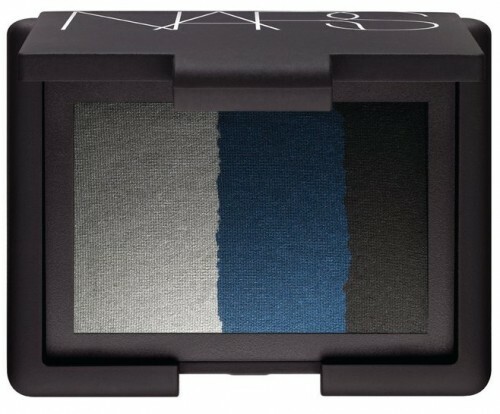 Named after Japan’s southern islands (which is said to boast good weather and “good fortune”), NARS just released their new Okinawa trio-compact — their first ever three-shadow compact. I think I love this even more because it has my favorite colors, the deep colbalt blue and black onyx). But the “Striking Silver” shade is also a necessary addition for highlighting effect (brow bone and inner eyelid). I would so use this for a smokey eye. 1) Using a damp Push Eyeliner Brush, line the eyes with the cobalt blue or black onyx shade to define them. 2) blend the black onyx or the cobalt blue hue into the upper and lower lash lines with the Eye Contour Brush for a smoky effect. 3) To temper the intensity of darker colors, use the Large Dome Brush to apply the silver shade all over the eye, from lash to brow. The compact is part of their Holiday collection, and available on narscosmetics.com now for $45.